Nationality: Japanese. Born: Tsingtao, China, of Japanese parents, 1 April 1920. Education: Attended Schools in China, and was graduated from Port Arthur High School; studied aerial photography. Military Service: Japanese Army, 1939–45. Family: Married Takeshi Shiro, 1950, two sons, one daughter. Career: 1946—joined Toho Film Company, and made debut in These Foolish Times ; also studied acting in the Toho drama school; 1948—first of several films for the director Kurosawa, Drunken Angel ; 1963—formed Mifune Productions; also directed the first film of the company, The Legacy of the 500,000 ; 1966—appeared in first English-language film, Grand Prix ; 1981—in TV mini-series Shogun . Awards: Best Actor, Venice Festival, for Yojimbo , 1961; Best Actor, Venice Festival, for Red Beard , 1965; also Kinema Jumpo Awards for Best Actor, 1961 and 1968. Died: 24 December 1997, in Tokyo, Japan, of organ failure. Interview with J. Gambol, in Cinema (Beverly Hills), Winter 1967. Interview with R. Guy, in Cinema (Beverly Hills), no. 1, 1969. "New York Salutes Japan's John Wayne," interview with C. Haberman, in New York Times , 4 March 1984. Interview with Y. Alion and Y. Oshima, in Revue du Cinéma (Paris), February 1990. Interview with H. Niogret, in Postif (Paris), June 1990. Owens, David. A Tribute to Toshiro Mifune , New York, 1984. LaBadie, D. W., "Toshiro Mifune: Japan's Top Sword," in Show (Hollywood), May 1963. Milius, John, "Toshiro Mifune: An Appreciation," in Cinema (Beverly Hills), Winter 1967. Checklist in Monthly Film Bulletin (London), August 1971. Niogret, H., "Toshiro Mifune," in Positif (Paris), May 1982. Belie, D. de, "Toshiro Mifune," in Ciné Revue (Paris), 21 July 1983. Grilli, Peter, "Civil Samurai," in Film Comment (New York), July/August 1984. "His Studio and Indie Less Active, Mifune to Hike Acting Chores," in Variety (New York), 23 September 1987. Gillett, J., "Toshiro Mifune," in Film Dope (Nottingham, England), January 1990. Obituary, in Variety (New York), 5 January 1998. Obituary, in Cahiers du Cinéma (Paris), February 1998. Akira Kurosawa said this of Toshiro Mifune's acting: "Many contemporary actors unfortunately do not bother too much with creative process. They acquired several acting procedures and they then use them whether it is suitable or not. I often remember Mifune. When we worked together on the film Shichi-nin no samurai [ Seven Samurai ] we shot the scene in which he explains to the samurais the disgrace of the peasants, and he cries. 'My hero is a peasant, and therefore he must cry like a peasant,' Mifune said to me. I was totally fascinated when he performed for me in front of the camera. In his acting performances there was always such remarkable sincerity and truth." Kurosawa and Mifune met for the first time in 1947 during the shooting of the film Yoidore tenshi [ Drunken Angel ]. It was a tragic story of a doctor in a postwar city, and Mifune splendidly played the character of a gangster ill with tuberculosis. It was his first great chance, after a short career of photography and two unimportant films. From that time on he only rarely missed playing in Kurosawa's films. The pairing is among the most famous in cinema, like that of John Ford and John Wayne and Martin Scorsese and Robert De Niro. Under Kurosawa's direction, Mifune gradually became Japan's premier film actor. His fame, and Kurosawa's, spread abroad with Rashomon , a masterly treatment of a samurai story of love and revenge narrated in five different forms. Mifune managed economically to interpret the characteristics of his heroes, their motivations, efforts, and ideas. He was boyishly direct and sensitive in Seven Samurai ; magnificent and cruel in Throne of Blood , Kurosawa's reworking of Shakespeare's Macbeth in a Japanese setting; heroic and courageous in a series of Samurai dramas ( Yojimbo , Sanjuro ); and self-complacent but at the same time morally upright and courageous in Kurosawa's absorbing crime film High and Low , based on a novel by the American writer Ed McBain. The collaboration was more than that of actor and director. Mifune and Kurosawa understood one another and complemented each other perfectly. 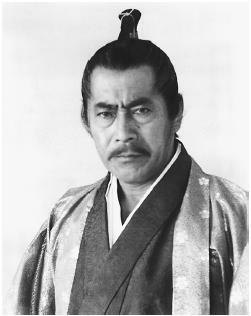 Mifune contributed ideas to the realization of particular scenes—for example, the filming of the duels in Sanjuro . He also contributed to entire films; for example, Kurosawa's Ran , a version of King Lear , is virtually Mifune's conception, even though he did not act in the film itself. An international star since 1966 when he appeared for director John Frankeheimer in the epic racing film Grand Prix , Mifune has acted in numerous films outside his native Japan. They include John Boorman's World War II epic Hell in the Pacific , opposite Lee Marvin; the Euro-Western Red Sun opposite Charles Bronson; the Kennedy conspiracy thriller Winter Kills ; and the epic television mini-series Shogun . More recently he appeared as an Eskimo in the Canadian-French adventure film Shadow of the Wolf . His most recent Japanese film, for director Kayo Hatta, was Picture Bride , a period tale set in the early years of this century, where he had a cameo as a narrator for silent films. Mifune and Kurosawa teamed for the last time as actor and director on Red Beard in 1965, a medical drama not unlike Drunken Angel , the film that brought the two together.